Almonds are a spectacular nut. They offer great health benefits. They are high in vitamins E and B2, protein, fiber, and healthy fats. They offer a high level of antioxidants and are beneficial for the cardiovascular system.1 These nuts have a mild taste that is great alone and with many other foods. They make a great nut butter. They can even be used to make a tasteful milk substitute. They grow on trees and are native to southwest Asia and the Mediterranean region. They grow well in warm regions such as California which produces 80% of the world's almonds. Although almonds are normally called a nut they are technically a seed which grows inside a hard fruit covering called a drupe. There are two varieties of almonds, sweet and bitter. As you likely guessed the sweet almond is the one that is eaten as a nut. The bitter almond variety is used to produce oil.2 The most striking aspect of the almond tree is the flowers. When in full bloom they are beautiful with five white to light pink petals. They have a rich fragrance that smells of honey butter. In the Bible, almonds are mentioned several times. In Genesis 43:11 Jacob tells his sons to take almonds with them into Egypt as one of the best foods of the land. These are to be a present to Joseph, probably because the almond was not a native to the region of Egypt. In Exodus 25:33-34 Moses was directed to decorate parts of the candlestick for the wilderness Tabernacle with carvings resembling branches and blossoms of the almond tree. Aaron's rod yielded almond blossoms and ripe almonds to prove he was God’s choice for high priest (Numbers 17:8). The most unusual mention of almonds is in the key text where Jeremiah sees an almond branch in vision. It is an odd verse the first time it is read. God asks Jeremiah "What do you see?" and Jeremiah says, "the branch of an almond tree." Then God seems to congratulate him on his powers of observation then completely change the subject. While God may seem absent minded at first, when reading the verse in context, it makes more sense. Throughout the chapter of Jeremiah 1 God repeatedly asks Jeremiah what he sees in vision, then makes an important statement. God uses these images as symbols. He is trying to help Jeremiah understand the crucial points of His message. Almond buds are usually the first to appear after the long winter. They usually start growing in late January before winter is completely gone.2 The Hebrew word for almond (shaked) means the tree that "hastens to awake." Here God is emphasizing his hast to fulfill his promises to his people. God would not delay in fulfillment of his gracious and divine promise. His message is the same to us today. Look at the bare branch of the almond tree, watch as I fulfill my promises in your life and make them bloom into a beautiful flower and bear delicious fruit. What can you do when you read something in the Bible, like the key text, that doesn't make any sense? Is it significant that God compares the fulfillment of his promises to a flower that blooms towards the end of winter? What promises has God given for your life that he has yet to fulfill? 1. Joe Leech, "9 Evidence-Based Health Benefits of Almonds," Healthline online, last modified September 6, 2018, https://www.healthline.com/nutrition/9-proven-benefits-of-almonds. 2. 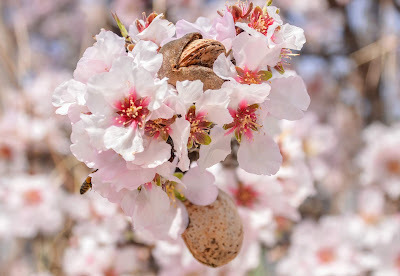 Melissa Petruzzello, "Almond," Encyclopædia Britannica online, last modified September 20, 2018, https://www.britannica.com/plant/almond.